And then into the museum, a shadowy foyer with a tightly spiraled boat's stair leading up to the exhibit. Some travelers reviewed this place as "quirky"—a word I have come to hate, not only because it's been tagged to my work in the past as a kind of dismissal, but also because in general it condescends to the pure strangeness of things. Here initial letters and manuscripts from Kafka's ancestors—of course the oppressive and intimidating father among them prominently—and a family tree illustrated with photographs and other portraits receding as you followed back to the family origins in the 17th century, obscure ancestors of Baroque Prague, the faces leading up to Kafka himself and the childhood portraits of his three lovely sisters—Ottla, Elli, and Valli, their lines ending abruptly at Chelmno and Auschwitz. This display circles a small, makeshift theatre, a classroom screen, five folding chairs in front of it. On the screen, early films of Prague cascade and ripple as though you were watching the city through water. Recognizable buildings emerge from the light—St. Vitus', the Astronomical Clock, the buildings that frame the Old Town Square –but not in the light that we had been seeing them over the past three days, the beautiful architectural "sights" and "vistas". Instead, they formed the circumference of an oppressive round followed by the child Kafka to and from school. I did a walk like that myself—or one of the same distance—but hardly through beautiful and narrow Baroque streets. 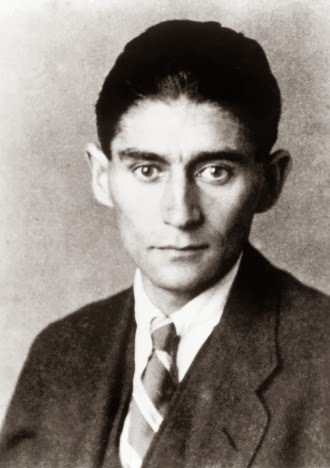 Mine was over desolate, working-class suburban terrain., but the desolation was external for that time and for a few years following, a span in which I felt celebrated and loved, lacking the genius and insight of young Kafka, his nerve-end sense of the nuanced, atmospheric menace of his home life. Later he would write of this almost preternaturally beautiful city, in language that appeared on the provisional screen in front of me: Prague doesn’t let go of us. This mother has claws. We have to submit or –. We would have to set fire to it in two places, at Vyšehrad and at the Prague Castle, then we might get away. I wondered how anyone could want to burn this city in order to leave it entirely. It seems impossible until you think of your own town, its particular pull and drain on its every inhabitant, no more or less in these cities than in any others, no more extraordinary because you are the young it has tried to eat, you are the one confined and injured by its custom. Is it every city, every home, that celebrates the wrong children while wronging the ones it overlooks? Or does it wrong the ones its celebrates, limning them in a tight circle whose outer edge is its own castles and high places?